Dictograph conversations and alleged bribery charges will be discussed by Chief of Police Beavers and Solicitor General Hugh Dorsey at a conference to be held to-day. 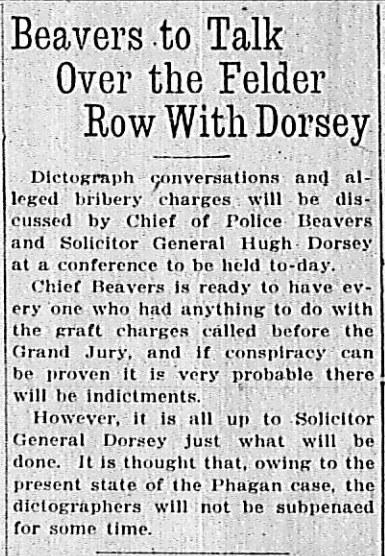 Chief Beavers is ready to have every one who had anything to do with the graft charges called before the Grand Jury, and if conspiracy can be proven it is very probable there will be indictments. However, it is all up to Solicitor General Dorsey just what will be done. It is thought that, owing to the present state of the Phagan case, the dictographers will not be subpenaed for some time.